I’m only getting the box of veggies from the farm every other week so this week I wanted to share a different “farm” experience with you. 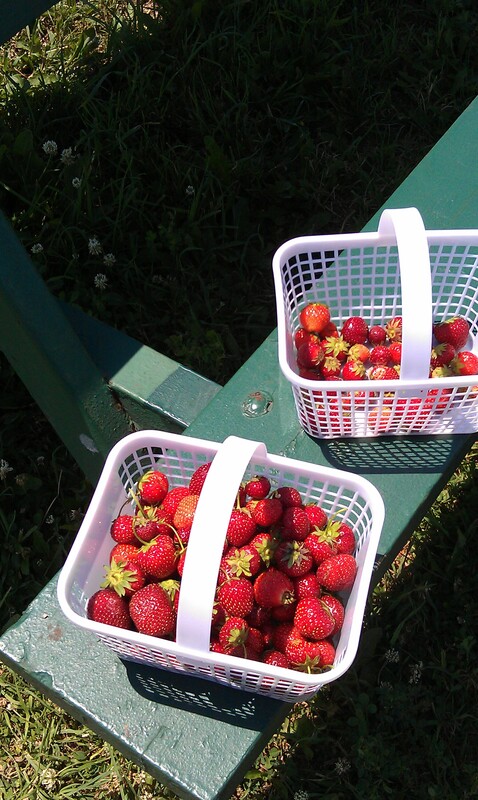 Just before the strawberry season ended, I was able to take my son strawberry picking. I had never gone picking of any sort before (at least that I can remember — my parents may have taken my sister and I apple picking once) so I was determined to do this with him. 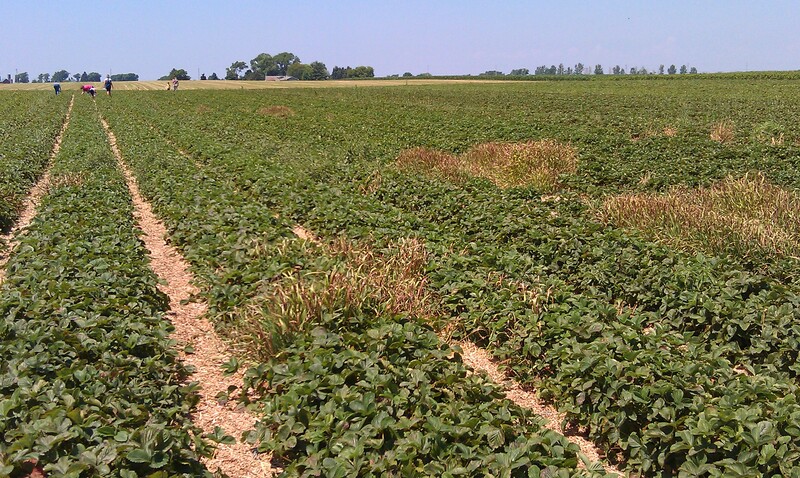 To locate a strawberry farm, I used www.pickyourown.org and clicked on my state. The site is a little busy visually, but it’s pretty easy to determine where you want to go and what is in season. My advice is to call ahead to make sure that the farm(s) you are interested in visiting have what the website says they have. I almost took the family to a place that didn’t have any more strawberries! We drove up and my son asked, “Is dat strawberry flying?” I had a hard time explaining that one. We walked along the rows. My son was enthusiastic at first and enjoyed looking for strawberries. 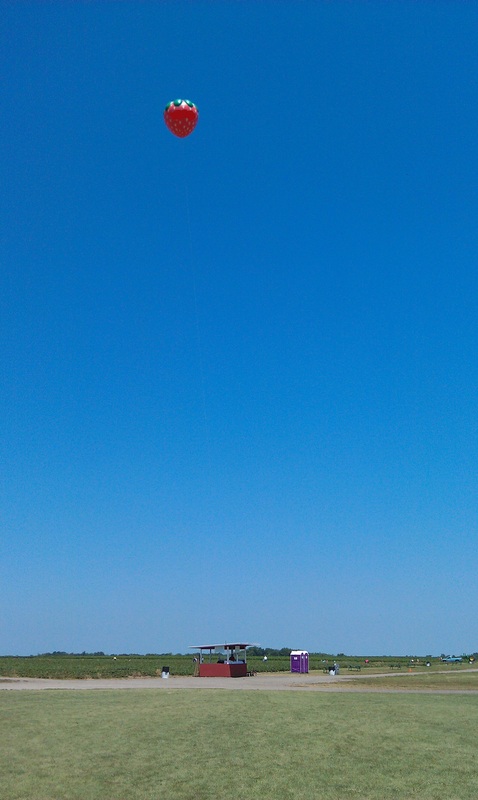 But he faded fast in the hot sun. I don’t know how long we were out there, but it was probably less than 20 minutes. My basket on the left and his on the right. He was so excited to eat them. I paid — they cost $3.80 at weighing — and we found a bench in the shade. While we nibbled, one patron commented, “The smaller, the sweeter.” When people brag about eating “real” strawberries, I get it now. They were delectable. 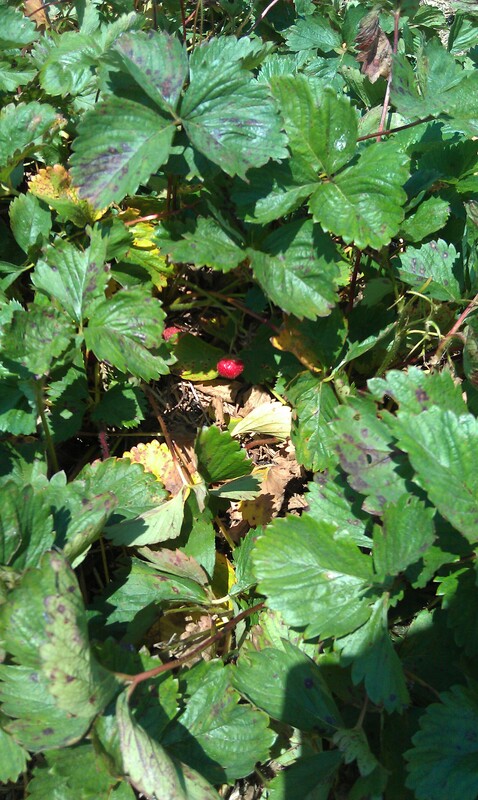 Most of the berries were one half or one quarter the size of strawberries sold at the grocery store. The skin of the berries we picked offered no resistance to my teeth and just exploded in my mouth. Later when we got home, I was happy that we had only picked a small amount because about 12 hours later the berries had already started to change. Some were still great the next day, but others changed color and generally wilted. They didn’t taste the same. 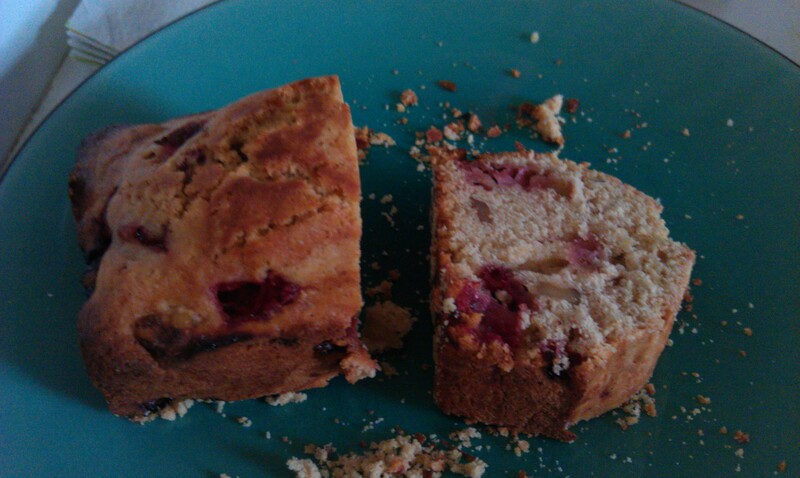 It made me wonder how modern grocery stores keep strawberries fresh… *shiver* Anyway, they were perfect for baking! 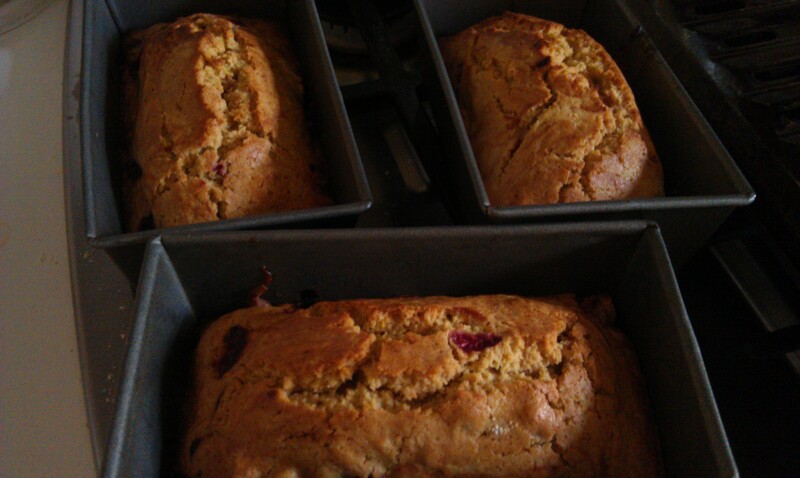 We made strawberry cupcakes the next day and strawberry bread the following day. Preheat oven to 350°F. Grease 9×5-inch non-stick loaf pan or three mini loaf pans. Mix oil, sugar, eggs, and vanilla in large bowl. Add flour, salt, baking powder and cinnamon to egg mixture. Add strawberries last and stir. Pour into pans. 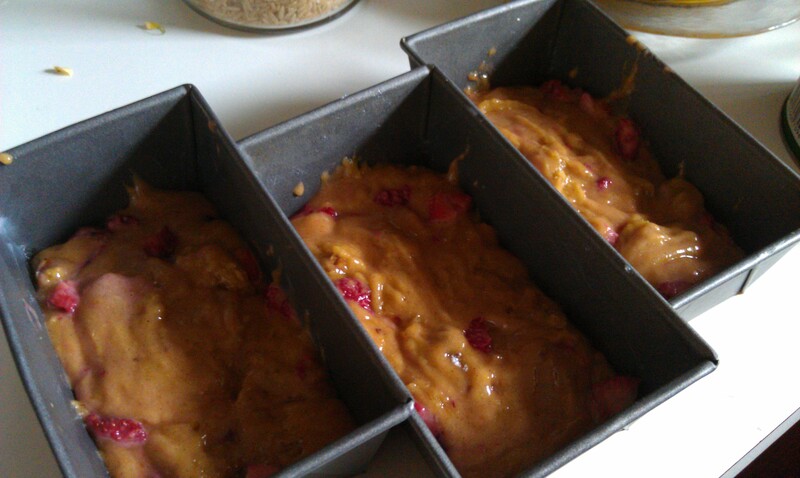 Bake for 35-45 minutes, depending on the oven. When the batter looked like this prior to baking, I was a bit nervous. But they came out beautifully! Next up? Raspberries, which will be in season in my area in August! Yummy yummy strawberries!! Looks super good! Wow, sounds like you two had lots of fun. We’re planning a trip to pick our own blueberries next week, I may steal your recipe and sub blueberries for strawberries. Fresh berries are the best! Tada! Also, our raspberry bush will probably be ready for picking in about a week. We have red and black raspberries planted and mullberries wild growing along the creek in the backyard. I’ll put some pics on Twitter when they’re ready. U-Pick is awesome! When I was a kid, my grandparents would draft all of us grandkids to go pick strawberries, then help turn them into jam. 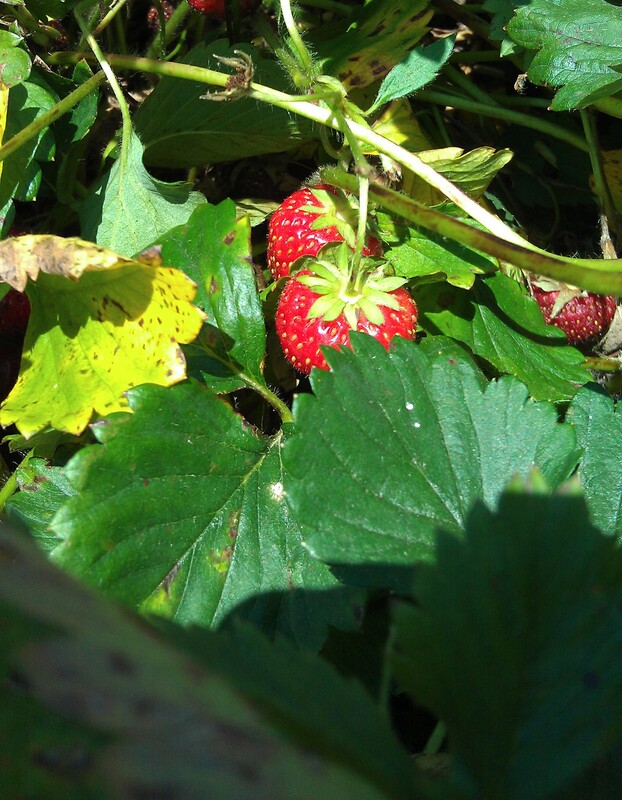 It was always a great weekend… This year, the only strawberries I picked were wild– an overgrown vacant lot in the neighborhood was reeming with them. They were fantastic! I went blueberry picking a few weeks ago; got carried away out there, and ended up with way too much. So I made muffins and gave them to some neighbors. Looks great and wonderful tip on the website. I know many people who are always looking for places like that, but never knew of a good source. From personal experience, I have to highly recommend going to an apple orchard/pumpkin patch in the fall too. We always went with my girl scout troop and it’s one of my favorite memories. Not only do you get food and a cool, hand picked pumpkin, but it’s also the best opportunity to learn. We love berry picking. My son is 8 now and quite the pro. We just did blueberries. And we have probably a couple more weeks of blueberry before we look to raspberries. I was flabbergasted when the berry farm let my son pick for free. He picked 1.5 quarts to my .5 a quart. I felt guilty and paid them extra for my measly half-quart. Of course we just ate some, had to freeze some, made some blueberry freezer jam then made blueberry popsicles (ocean spray recipe). We have to go back so I can get more for making syrup and muffins to freeze. The bread looks delicious and I want to try it. But we don’t have gluten free flour – can you use regular flour? Mrs. Q, the strawberries you picked are probably not the same variety as the ones sold in supermarkets. The ones that travel from Florida and California to other parts of the country are bred to resist bruising and stay fresh longer. Unfortunately, those varieties don’t usually have as much flavor as the varieties typically grown on family farms and sold for local consumption. The orchards in my neighborhood started picking peaches last week. That’s what I look forward to most each year. I love trying different varieties. My favorite way to eat them is sitting on the beach watching the birds and boats and people. That’s the best recipe I know although I have to tell you I wouldn’t mind a bit if a slice of that strawberry bread showed up in my picnic tote! Oh, and you can also make them last longer, unwashed if you have them stored in a cooler with a little ice block… they won’t like the refrigerator too much and just need to be cooled. Oooo! I forgot! There was a post on lifehacker or somewhere about making your berries last longer if you rinse them in a 1/10 vinegar/water solution. I will pick several pounds of berries and freeze most of them whole. They are great in smoothies, etc. If you have any left in the freezer by the next year, you can use them up and make jam, either freeze it or can it. They freeze very well – I just pop the hulls off, wash them, and put them in zipper freezer bags. mmm…. going to try this- but maybe w/ frozen strawberries. i have my own ‘template’ for GF breads- just made zuchinni bread this week! My family went strawberry picking, too. The boys had a blast, although I’ll admit I had a lot of fun, too. There is just something special about going out into a fresh field and handpicking your food! We had a lot of berries and I knew there was no way we could consume them all in a few days so I took a good chunk of them, laid them out on waxed paper on a cookie sheet and froze them. Once they were frozen solid I placed them in a freezer safe, airtight container and popped them back into the freezer. We had fruit smoothies from our strawberries and they were delish! Like your son, I have low tolerance for being out in the sun (I wilt! ), but I find wearing a hat and being very hydrated helps a lot.